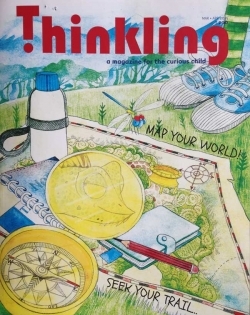 We’re hitting the trail in this issue of Thinkling! Equipped with map and compass, imagination and intuition, full backpacks and empty pockets, you’ll be ready to explore the great outdoors! You’ll make and use a compass, learn the history of cartography or mapmaking, and glimpse into how we use electronic navigation. You’ll dive into the world of animals that don’t need maps on their long journeys, and marvel at the skills they do use instead. And when you come home, full of memories and stories, be sure to write everything down, taking tips from travel writer Tarquin Hall. So grab this issue and a companion, and let’s see where your footsteps lead you this spring! This issue of Thinkling has Google Maps coordinates marked for a couple of places on the planet that we really want to you to look at from another perspective. Be sure to try this out!